Purpose: The purpose of this study was to determine the effects of thoracic and rib manipulation on pain and restricted shoulder mobility in subjects with frozen shoulder. Relevance: The term frozen shoulder was first introduced by Codman in 1934 and described as "a painful condition of insidious onset that was associated with stiffness and difficulty in sleeping on the affected side." The main physical therapy program consists of thermotherapy, shoulder exercise, mobilization techniques, Codman's exercise, and capsular stretches. Recent discussion in the physical therapy community has been targeted toward addressing the thoracic spine for treating the patients with shoulder impairments. Participants: A total of 30 subjects (mean age of 55.70 ± 9.49 years) with the diagnosis of frozen shoulder stage II and III were recruited from outpatient department of Physiotherapy of KLES Dr. Prabhakar Kore Hospital and MRC and KLES Ayurved Hospital and Research Centre, Shahpur, Belgaum. Methods: The present randomized clinical trial was conducted on 30 subjects. They were randomly allocated into two groups. 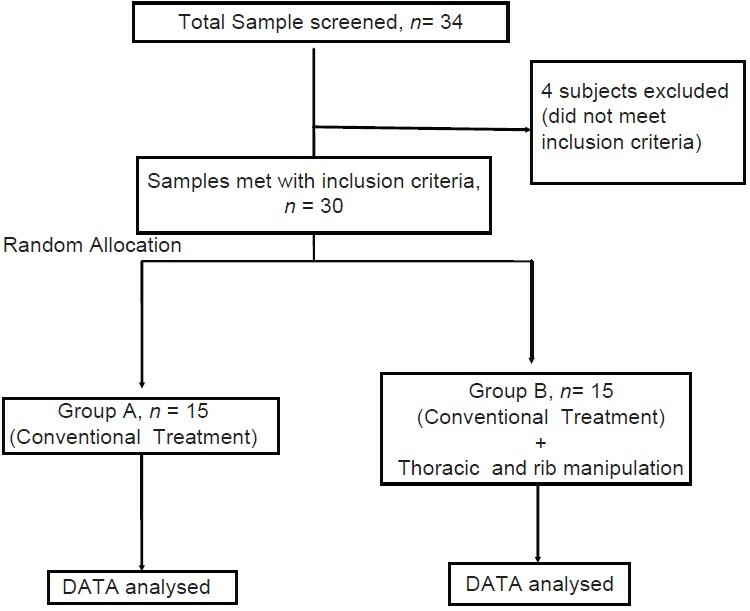 Group A (n = 15) receiving conventional therapy for 6 sessions a week for 2 weeks and Group B (n = 15) receiving thoracic and rib manipulation 3 sessions a week for 2 weeks in addition to conventional therapy. The outcome measures taken were visual analogue scale (VAS), shoulder range of motion (ROM) of flexion, abduction, internal rotation and external rotation and Disabilities of Arm Shoulder and Hand (DASH) score. The outcomes were assessed on day 1 pretreatment and day 14 posttreatment. Data was analyzed using SPSS software. Results: The intra group mean difference in pre and postvalues for Group A were 4 ± 0.27 cm, 49.7° ±13.3°,49.3° ±13.38°, 21.4° ±7.33°, 23.9° ±7.51°, and 893.3° ±269.66° for VAS, shoulder ROM of flexion, abduction, internal rotation, external rotation and DASH scores respectively. While for Group B intra group mean differences in pre and postvalues were 5.7 ± 0.66 cm, 64.1° ±7.09°, 71.1° ±5.59°, 32.3° ±5.23°, 40.9° ±5.52°, 1073.3° ±229.42° for VAS, shoulder ROM of flexion, abduction, internal rotation, external rotation and DASH scores respectively . The intra group comparison showed statistical significance with P < 0.001.Whereas results of the between the group comparison showed that Group B showed better improvement than Group A that was statistically significant with P < 0.001. Conclusion: Based on the results of the present study it can be concluded that thoracic and rib manipulation is effective in relieving pain, improving the shoulder range and reducing disability in patients with Frozen Shoulder. Clinical Implication: Thoracic and rib Manipulation can be added in the treatment plan for frozen shoulder for better and speed recovery. Reeves,  in a long-term study of the natural history of frozen shoulder, concluded that the disease is self-limiting, however, many patients suffer for more than 3 years with an average duration of 30.1 month. A disability of this duration can obviously place severe emotional and economic hardship on the affected individual. Clinical reports of the patients with adhesive capsulitis show considerable variability in methods of treatment; however, virtually all of them advocate some form of exercise to restore mobility. The treatment options for frozen shoulder vary. It includes supervised rehabilitation, steroidal anti-inflammatory medications, oral corticosteroids, intra-articular injections, suprascapular blocks, distension arthrography, and closed manipulation, open surgical release, and arthroscopic capsular release. Treatment by means of physiotherapy can consist of different broad range of interventions such as electrotherapy, exercises, and manual therapy approaches such as joint mobilization, soft tissue manipulation, neuromuscular therapies etc. Relief of pain is achieved by means of massage, deep heat, ice, ultrasound therapy, Transcutaneous electrical nerve stimulation (TENS), Magneto therapy, or laser therapy, mobilization and home exercise program. Recent discussion in the physical therapy community has been targeted towards addressing the thoracic spine for patients with shoulder impairments. Some authors like Grubbs,  and Neviaser  have suggested the occurrence of the guarded shoulder movements in FS. At rest, the patients hold the affected arm in adduction and internal rotation. Shoulders are rounded, stooped, and arm elevation is affected in a protective manner. Thus, thoracic restrictions tend to develop. Hence there is paucity of studies for use of thoracic manipulation in subjects with frozen shoulder Exploratory studies of this nature are needed and hence the present study intends to determine long term effects of the thoracic and rib manipulation on shoulder pain and ROM in subjects with frozen shoulder. The study was a Randomized Clinical Trial. The study sample included subjects with frozen shoulder. Nonprobability Convenience method was used and random allocation of subjects into two groups done by using the envelope method. Subjects were recruited form physiotherapy OPD of KLES Dr. Prabhakar Kore Hospital and MRC, Belgaum. 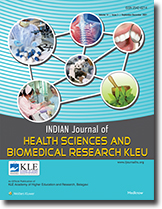 KLES Ayurved Hospital and Research Centre, Shahpur, Belgaum, and Urban Health Centre, Rukmininagar, Belgaum. The study period was 12 months. Those who are able to comprehend command and willing to participate in the study. Subjects were excluded if they had (i) Any previous Surgery on the affected shoulder. (ii) Recent trauma to shoulder complex. (iii) Thoracic outlet syndrome. (iv) Cervical symptoms (tingling, numbness). (v) Rotator cuff tears of affected shoulder. (vi) Fractures involving shoulder complex. (vii) Osteoporosis of spine. (viii) Ankylosing spondilitis. Ethical clearance was obtained from Ethical Committee, KLEU Institute of Physiotherapy before commencing the study. Informed consent was taken from the subjects. The outcomes were assessed preintervention on day 1 and postassessment on day 14. Range of motion (ROM) was measured using universal goniometer. 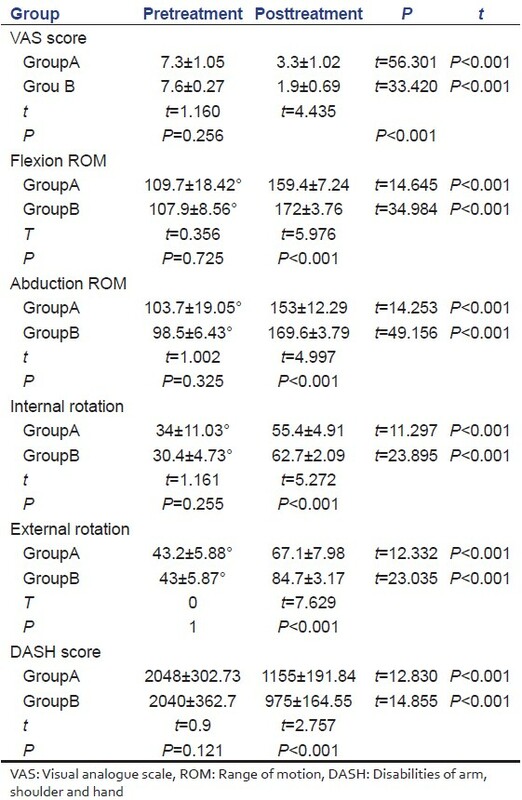 Active ROM of shoulder flexion, abduction, internal rotation and external rotation were measured using standard techniques. The procedure was explained to the subjects. Subjects diagnosed of frozen shoulder were screened for thoracic mobility and those with restricted mobility were included in the study. Group A was given conventional therapy for frozen shoulder that included HMP, exercises, TENS. While, Group B was given thoracic and rib manipulation in addition to conventional therapy. Depending upon the presence of specific thoracic and/or rib impairment the technique  was given. Manipulations were given 3 sessions in a week for 2 weeks. Subjects with thoracic flexion/opening restriction will be treated with supine technique for segmental thoracic flexion [Figure 1]. Subjects with unilateral rib dysfunction will be treated with supine unilateral rib manipulation for rib mobility [Figure 2]. Subjects with thoracic extension or closing restriction were treated with a prone extension manipulation for facilitating segmental thoracic extension [Figure 3]. The statistical analysis was done using SPSS software (IBM Corporation). Homogeneity of group was calculated using Student's t-test, Fisher Exact test and Chi square test. Inter group analysis was done by students unpaired t-test and intra group comparison was done using students paired t-test. A total of 34 subjects were screened. Four of them were excluded as they did not meet the inclusion criteria. Thirty subjects were then randomly allocated into two groups [Figure 4]. The demographics details of the subjects are given in [Table 1]. 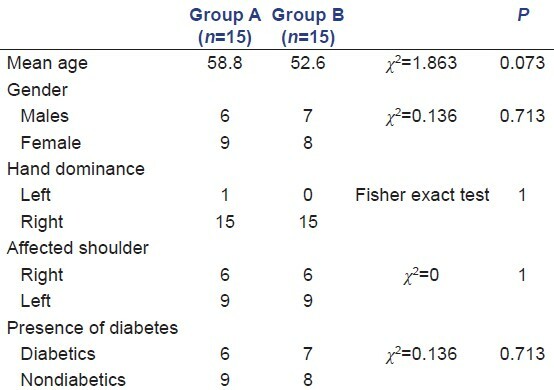 The groups were homogenous in terms of mean age, gender, affected shoulder, hand dominance, affection by diabetes. The outcome measures at baseline were evaluated. There was no difference between the groups [Table 1]. [Table 2] For Group A pre and postintervention, within group analysis showed significant differences in outcome measures (P < 0.001). VAS score reduced from 7.3 ± 1.05 (day 1) to 3.3 ± 1.02 (day 14). ROM of flexion also improved significantly from 109.7 ± 18.4 (day 1) to 159.4 ± 7.24, (day 14). Abduction, increased from 103.7° ±19.05° (day 1) to 153° ±12.29°, (day 14).Internal Rotation increased from 34° ±11.03°(day 1) to 55.4° ±4.91° (day 14), Shoulder external rotation increased from 43.2° ±5.88° to 67.1° ±7.98° (day 14), DASH score reduced from 2048° ±302.73° (day 1) to 1155° ±191.84° (day 14). For Group B, pre (day 1) and post (day 14) intervention there was a significant difference in outcome measures.(<0.001). VAS Score reduced from 7.6 ± 0.27 to 1.9 ± 0.69. ROM of flexion increased from 107.9° ±8.56° to 172° ±3.76°. Range of shoulder abduction increased from 98.5° ±6.43° to 169.6° ±3.79°. Range of Internal Rotation increased from 30.4° ±4.73° to 62.7° ±2.09°. Range of motion of shoulder external rotation increased from 43° ±5.87° to 84.7° ±3.17°. Disabilities of arm shoulder and hand score reduced from 2040° ±362.7° to 975° ±14.55°. ` Between groups analysis showed that improvement was better in Group B which was statistically significant for all the outcome measures. The difference in VAS score postintervention between the groups was 1.4 which was statistically significant (P < 0.001). The present study was conducted to determine effects of thoracic and rib manipulation on pain and restricted shoulder mobility in subjects with frozen shoulder. The result from statistical analysis of the present study showed thoracic and rib manipulation effective on pain and restricted shoulder mobility in subjects with frozen shoulder. The manipulation group showed more reduction of pain. The hypoalgesic effect of manipulation may contribute to the reduction of shoulder pain and a resultant increase in shoulder motion in this study. Several authors have reported a hypoalgesic effect in distal extremities following bouts of spinal manipulative interventions. Vicenzino et al. and Fernαndez-Carnero  et al. both demonstrated this rapid hypoalgesic effect following cervical manipulative therapy in patients with lateral epicondylalgia. High velocity low amplitude thrust techniques help to restore normal articular relationship and function. It also helps to restore normal joint mechanics. It causes normalization of joint functions and related local or remote symptoms  (mootz, trianio  manipulation activates Type I and Type II mechanoreceptors (Wyke, 1980). These receptors exert a reflexogenic influence on muscle tone. There is an immediate decrease in pain after manipulation due to reflex decrease in muscle spasm. (fisk) Thus HVLA applied to thoracic spine leads to improved thoracic mobility. Thereby improving range around thoracic spine and shoulder as well. The present study suggests that thoracic spine and rib manipulation helps to reduce pain and increase the ROM around shoulder. The positive results in the present study could be explained using the concept of Regional Interdependence as described by Wainner. In our study, shoulder and thorax are considered to have regional interdependence. Similar regional interdependence was also proven in several clinical trials and demonstrated the effective use of this regional examination and treatment approach in achieving positive functional outcomes for patients with a variety of musculoskeletal disorders ,,,,, of which some studies, ,, have investigated the effects of including cervicothoracic spine and rib manual physical therapy into an overall treatment approach for patients with shoulder pain. Cleland et al. have demonstrated an increase in lower trapezius muscle strength immediately following thoracic manipulation. Suter et al. have also demonstrated decreased biceps muscle inhibition following cervical manipulation and decreased quadriceps inhibition following sacroiliac manipulation, suggesting regional interdepence between these regions. The results of present study were similar to the study conducted by Daniel et al.,  on adhesive capsulitis/Frozen Shoulder were they compared manipulation vs mobilization. Manipulation included in this clinical trial was for shoulder, cervical and thoracic spine HVLA chiropractic manipulative therapy (CMT). And another group received shoulder mobilization. They found significant reduction in SPADI scores in both the groups but CMT with exercise had a superior effect in the short-term treatment of stage 2 and stage 3 frozen shoulder and compared to mobilization group. In a case report by Kazemi,  on secondary adhesive capsulitis in a 47-year-old female a recreational squash player showed positive results on application of spinal manipulation therapy (SMT) to the patient. The SMT of the cervical and the thoracic spine was given 3 times/week for 2 weeks. Immense improvement in ROM and pain was observed. Polkinghom  reported successful treatment of 2 cases of adhesive capsulitis with shoulder, cervical and thoracic spine manipulation. In this study, mechanical force to use for manipulation. In present study manual force is utilized to the purpose of manipulation. The study had some limitations. The sample size was small. Long term follow-up of the patients was not done. Blinding was not done for intervention and assessing outcomes. Further studies with larger samples can be conducted. Blinding should be done in order to reduce potential bias. Thoracic and rib manipulation can be compared with other schools of manual therapy (Like Maitland, Mulligan etc.) for managing subjects with frozen shoulder. Thoracic and rib manipulation is effective in reducing pain, increasing ROM and function of shoulder in subjects with frozen shoulder. Further it was noticed that manipulation group was more effective in relieving pain and improving the shoulder ROM and function. Thoracic and rib Manipulation can be added along with the conventional therapy in the management of Frozen Shoulder. The manipulative therapy can also be compared with other schools of manual therapy for the management of frozen shoulder. Tate AR, McClure PW, Young IA, Salvatori R, Michener LA. Comprehensive impairment-based exercise and manual therapy intervention for patients with subacromial impingement syndrome: A case series. J Orthop Sports Phys Ther 2010;40:474-93. Brotzman SB, Wilk KE. Clinical Orthopaedic Rehabilitation. 2 nd ed. Philadelphia: Mosby; 2003. Zuckerman JD, Rokito A. Frozen shoulder: A consensus definition. J Shoulder Elbow Surg 2011;20:322-5. Reeves B. The natural history of the Frozen Shoulder syndrome. Scand J Rheumatol 1975;4:193-6. Snell R. Clinical Anatomy. 7 th ed. Baltimore: Lippincott William and Wilkins. 2003. p. 214-35. Carette S. Adhesive capsulitis - Research advances frozen in time? J Rheumatol 2000;27:1329-31. Crawford HJ, Jull GA. Influence of thoracic posture and movement on range of arm elevation. Physiother Pract 1993;9;143-8. Grubbs N. Frozen Shoulder syndrome: A review of literature. J Orthop Sports Phys Ther 1993;18:479-87. Neviaser J. Adhesive capsulitis of the shoulder: A study of the pathological findings in periarthritis of the shoulder. J Bone Joint Surg1945;27:211-22. Maitland G. Maitland's Vertebral Manipulations. 7 th ed. Oxford, UK: Butterworth Heinmann; 2005. Bergmann TF. Short lever, specific contact articular chiropractic technique. J Manipulative Physiol Ther 1992;15:591-5. Lewit K. Manipulative Therapy, Musculoskeletal Medicine. Edinburgh: Churchill Livingstone, Elsevier; 2009. Wainner RS, Whitman JM, Cleland JA, Flynn TW. Regional interdependence: A musculoskeletal examination model whose time has come. J Orthop Sports Phys Ther 2007;37:658-60. Bang MD, Deyle GD. Comparison of supervised exercise with and without manual physical therapy for patients with shoulder impingement syndrome. J Orthop Sports Phys Ther 2000;30:126-37. Deyle GD, Allison SC, Matekel RL, Ryder MG, Stang JM, Gohdes DD, et al. Physical therapy treatment effectiveness for osteoarthritis of the knee: A randomized comparison of supervised clinical exercise and manual therapy procedures versus a home exercise program. Phys Ther 2005;85:1301-17. Daniel MR, Paul WJ, James WB, Gary G, Felix L. A prospective clinical trial comparing chiropractic manipulation and exercise therapy vs. chiropractic mobilization and exercise therapy for treatment of patients suffering from adhesive capsulitis/frozen shoulder. J Am Chiropr Assoc 2008;45:12-28. Gleberzon B. Successful chiropractic management of a centenarian presenting with bilateral shoulder pain subsequent to a fall. Clin Chiropr 2005;8:66-74. Pribicevic M, Pollard H, Bonello R, de Luca K. A systematic review of manipulative therapy for the treatment of shoulder pain. J Manipulative Physiol Ther 2010;33:679-89. Bijur PE, Silver W, Gallagher EJ. Reliability of the visual analog scale for measurement of acute pain. Acad Emerg Med 2001;8:1153-7. Kelly AM. The minimum clinically significant difference in visual analogue scale pain scores does not differ with severity of pain. Emerg Med Journal 2001;18:205-7. Solway S, Beaton DE, McConnell C, Bombardier C. The DASH outcome measure user's Manual. Toranto: Oranto Institute for Work and Health; 2002. Stiller J, Timothy L. Outcome Measures of Upper Extremity Function, Clinical Evaluation and Testing, Athletic Therapy Today, Human Kinetics; 15-17 May, 2005. Greenman PE. Principles of Manual Medicine. 2 nd ed. Baltimore, MD: Williams and Wilkins; 1996. Hovind H, Nielsen SL. Effect of massage on blood flow in skeletal muscle. Scand J Rehabil Med 1974;6:74-7. Ebnezar J, Essentials of Orthopaedics for Physiotherapists. Reprinted 2 nd ed. Jaypee Medical Book Publishers: New Delhi;2002. p. 226. Leclaire R, Bourgouin J. Electromagnetic treatment of shoulder periarthritis: A randomized controlled trial of the efficiency and tolerance of magnetotherapy. Arch Phys Med Rehabil 1991;72:284-7. Vicenzino B, Collins D, Wright A. The initial effects of a cervical spine manipulative physiotherapy treatment on the pain and dysfunction of lateral epicondylalgia. Pain 1996;68:69-74. Fernández-Carnero J, Fernández-de-las-Peñas C, Cleland JA. Immediate hypoalgesic and motor effects after a single cervical spine manipulation in subjects with lateral epicondylalgia. J Manipulative Physiol Ther 2008;31:675-81. Iverson CA, Sutlive TG, Crowell MS, Morrell RL, Perkins MW, Garber MB, et al. Lumbopelvic manipulation for the treatment of patients with patellofemoral pain syndrome: Development of a clinical prediction rule. J Orthop Sports Phys Ther 2008;38:297-309. George SZ, Bishop MD, Bialosky JE, Zeppieri G Jr, Robinson ME. Immediate effects of spinal manipulation on thermal pain sensitivity: An experimental study. BMC Musculoskelet Disord 2006;7:68. Hadelman S. Principles and Practice of chiropractic. 3 rd ed. New York: McGraw Hill; 2005. Anderson R, Meeker WC, Wirick BE, Mootz RD, Kirk DH, Adams A. A meta-analysis of clinical trials of spinal manipulation. J Manipulative Physiol Ther 1992;15:181-94. Triano JJ. Studies on the biomechanical effect of a spinal adjustment. J Manipulative Physiol Ther 1992;15:71-5. Mohanty US. Manual Therapy of the pelvic complex: A compendium of iilustrated Manual Therapy techniques. 1 st ed. Mangalore. MTFI Health Care Publication; 2010. Bergman GJ, Winters JC, Groenier KH, Pool JJ, Meyboom-de Jong B, Postema K, et al. Manipulative therapy in addition to usual medical care for patients with shoulder dysfunction and pain: A randomized, controlled trial. Ann Intern Med 2004;141:432-9. Winters JC, Sobel JS, Groenier KH, Arendzen HJ, Meyboom-de Jong B. Comparison of physiotherapy, manipulation, and corticosteroid injection for treating shoulder complaints in general practice: Randomised, single blind study. BMJ 1997;314:1320-5. Bronfort G, Evans R, Nelson B, Aker PD, Goldsmith CH, Vernon H. A randomized clinical trial of exercise and spinal manipulation for patients with chronic neck pain. Spine (Phila Pa 1976) 2001;26:788-97. Walker MJ, Boyles RE, Young BA, et al. The effectiveness of manual physical therapy and exercise for mechanical neck pain: A randomized clinical trial. Spine. 2008;33:2371-2378. Cleland J, Selleck B, Stowell T, Browne L, Alberini S, St. Cyr H, et al. Short-term effects of thoracic manipulation on lower trapezius muscle strength. J Man Manip Ther 2004;12:82-90. Suter E, McMorland G, Herzog W, Bray R. Decrease in quadriceps inhibition after sacroiliac joint manipulation in patients with anterior knee pain. J Manipulative Physiol Ther 1999;22:149-53. Kazemi M. Adhesive capsulitis: A case report. J Can Chiropr Assoc 2000;44:169-176. Polkinghorn BS. Instrumental chiropractic treatment of frozen shoulder associated with mixed metastatic carcinoma. J Manipulative Physiol Ther 1995;7:98-102.